Our community is becoming bigger and bigger and to thank the community for their support on March 1st, 2018 Yee’s Twitter followers could get 50 YEE tokens per follower. How to get 50 YEE tokens? 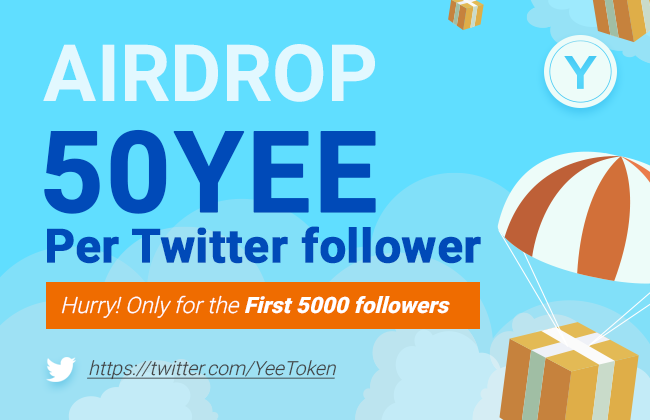 The airdrop will be available only for the first 5000 Twitter followers that finish all the steps and claim the YEE tokens. The airdrop will be distributed as soon as possible after we verified all 5000 followers. • In order to get airdrop rewards, you need to follow Yee official Twitter and stay in Yee official telegram group. Please do not change your Twitter handle and telegram username during the YEE coin airdrop. Otherwise you would not be able to get rewards, because we could recognize you in the Twitter followers. • Only REAL Twitter follower and active members of Yee official telegram group will get the airdrop. Bots and fake users will be removed from reward list. • One ETH/YEE wallet address cannot be submitted multiple times. Multiple users submitting one ETH/YEE wallet address will be regarded as cheating behavior. Yee team reserves the right to change these terms and conditions at any time without prior notice.